Arrival Transfer: - On arrival into Buenos Aires you will be met and transferred to your hotel. Please join us this evening at the hotel for a welcome three-course dinner with drinks included (beer, wine and soft drinks). Buenos Aires, Argentina’s elegant, historic and cosmopolitan capital, is known as the “Paris of the South” due to its European atmosphere with glamorous avenues lined with fashionable shops and Parisian-style restaurants and cafes. Located on the western shore of the estuary of the Río de la Plata, Buenos Aires has many fascinating neighbourhoods to explore including the colourful and lively La Boca, home to art galleries and tango shows; San Telmo with its restored mansions and antique stores and Recoleta, the city’s most exclusive area. Overnight in a Deluxe Room at Palacio Duhau Park Hyatt including breakfast. This morning you will enjoy a private city tour of Buenos Aires. The tour will take in the main highlights, but we would prefer to tailor the trip to your liking and go off the beaten track. It could be that you want to see more of the main sites, or it could be that you want to stroll amongst the small local boutiques of Palermo or the Parisienne buildings of Recoleta. Duration: 4 hrs. Includes transport & guide. This afternoon you will have free time to explore this fabulous city, we highly recommend the famous San Telmo Markets which only operate on Sunday until 4pm. Every Sunday, Dorrego Square in San Telmo district hosts over 270 stands offering their unique goods - antiques and knick knacks. Gramophones, clothes, jewels, lamps and an endless number of ornaments can be found at this traditional fair. San Telmo is at the heart of the Buenos Aires tango district and the whole area is thronged with musicians, singers, tango dances and mimes. Having a drink and relaxing by the sidewalk seating areas of one of the local bars is a perfect way to enjoy the festive atmosphere. This evening you will be collected from the hotel for an evening of the famous Tango. The Faena Hotel, where Rojo Tango is located, is a five star hotel in the upscale Puerto Madero district. Designed by the famous Alan Faena, the brick hotel is a beautiful setting for this dramatic, cabaret style tango show. The Rojo Tango dinner and show* promises “love, passion, madness and glamour” expressed through the beauty and history of tango. The venue is all red - the curtains, carpeting and chairs— the show plays to this ambiance of romance and melodrama so settle in for a night of good fun and delicious food! INCLUDED: round trip transfers, 3 x course dinner, wine and soft drinks. Today is at your leisure. There are so may wonderful things to experience in Buenos Aires. Take a stroll around one of their many museums such as the famous Museo Nacional De Arte Decorativo. Explore the Puerto Madero riverfront. Booming with business and shopping, this is a modern area full of shops and restaurants and things to enjoy. Visit the Recoleta neighbourhood situated in Junin y Guido, a neigbourhood famous for its historical buildings, shopping and cafes. This evening you will be collected from the hotel for The Argentine Experience*. This unique dining experience cleverly blends exquisite food and wine, local culture and social integration. The dinner is mixed around banquet tables, led by two charismatic guides, and supported by our international team. They teach the art of making traditional empanadas, then everyone gets creative in Argentina’s first and only novelty empanada competition. Alongside your creations, enjoy grilled provoleta cheese with sliced chorizo sausage and pork flank steak. Next, enjoy what some are boldly claiming to be one of the best steaks in Argentina, with our unique 24 hour preparation, cooked to order and accompanied with velvety mashed potatoes and oven roasted vegetables (Vegetarian/Pescatarian and celiac options available). For dessert, make your own alfajores and learn about the history and etiquette of mate, Argentina’s national pastime. The meal is paired with endless excellent wines from limited boutique lines. The guides throughout the evening will answer questions on Argentine cuisine and culture. *Maximum tour capacity is 60 people so an alternative experience may be required. This morning you will be collected from the hotel for an authentic day in the countryside at an exclusive estancia in Cañuelas. Once you get to the estancia around 11am you will have a typical welcome/starter of empanadas and beverages, and for lunch you will enjoy a typical Argentine country style asado prepared using only the finest quality meats. Dessert is accompanied by a folklore show, which is followed by a demonstration of gaucho skills. There will be three riders showing the gaucho skills with horses, traditional games, and races. Other included activities are: horse riding, bicycles, football and volleyball and guided visits to the stables. Essential info: Lunch is included with soft drinks and a glass of wine, but extra alcoholic drinks are not included. Duration: 9 hours. Vehicle pick up. Highly trained, professional guides. Departure Transfer: - You will be collected from your hotel at the appropriate time and transferred to the domestic airport for your onward journey from Buenos Aires. Arrival Transfer: - On arrival at Iguazu airport, you will be met and transferred to your hotel. *Please note the Iguazu Tourist Tax will now be charged on check out at all Iguazu hotels. The amount is currently ARS50 (USD3.40) per person per stay. Please note this tax is subject to change without prior notice. The spectacular Iguazu Falls that straddle the Argentine-Brazil border, are made up of 275 individual waterfalls lining a 2.7km wide horseshoe-shaped gorge. The Falls are located where the Iguazu River cascades over the edge of the Paraná Plateau. The Falls can be viewed from both the Argentinian and the Brazilian sides, the Brazilian side offering a broader, panoramic view, with the Argentinian side offering a series of catwalks that allow you to experience the Falls from close range. Welcome event + Dinner at Sheraton Iguazu. Please join us this evening at the hotel for a welcome dinner including drinks (wine, beer and soft drinks). Overnight in a Classic Falls View Room at Sheraton Iguazu including breakfast (Deluxe Category Accommodation). *Walking shoes and changes of clothes required. INCLUDED: National Park entrance fees & boat tickets. Evening is at your leisure. Private Transfer Sheraton to Hotel Das Cataratas. Overnight in a Deluxe Room at Hotel Das Cataratas including breakfast. Today we see the falls from the Brazilian side of the border. We highly recommend the walkways and steps which allow you to get up close to the spray. For those feeling a little weary, there is the option for either/or where you can board buses for a tour of the park. Equipped with panoramic windows, the buses are designed to maximize your views of the falls.Views of the Floriana Falls, the Devil’s Gorge Canyon and the Iguazu River are spectacular and are guaranteed to impress. Then its time to strap yourself in for a flight of a lifetime as you take a helicopter flight over the falls. The flight which last for ten minutes is sure to be an unforgettable experience. Includes National Park Entrance Fees & Helicopter Flight. This evening is at your leisure (event can be organised if preferred). INCLUDED: National Park Entrance Fees & Helicopter Flight. Overnight in a Deluxe Room at Hotel Das Cataratas including breakfast. Departure Transfer: - You will be transferred to the airport for your onward flight from Iguazu. Includes Guide. Arrival Transfer: - On arrival into Rio de Janeiro you will be met and transferred to your hotel. Known as the ''Cidade Maravilhosa'', or Marvellous City, Rio never fails to amaze with its sandy beaches, carefree lifestyle and unparalleled natural beauty. As the capital of Brazil until 1960, Rio is today one of the most culturally and economically prominent cities in the country, receiving more tourists than any other part of Brazil. This afternoon is at your leisure. We would recommend taking a stroll along the world-famous Copacabana Beach your hotel is situated on. At the end of this beach is a famous military fort, Forte Duque de Caxias. This is a military base is open to the public. 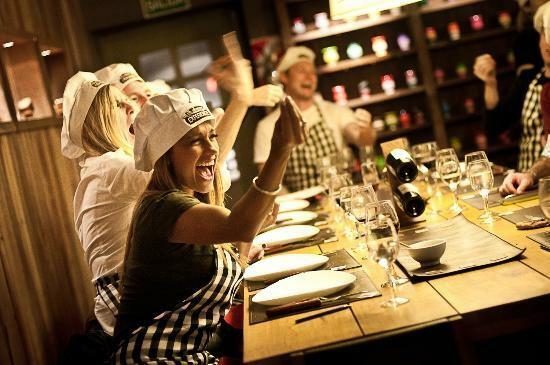 Or taste some of the most locally beloved Brazilian dishes and discover why so many food connoisseurs flock to Rio during a traditional cooking class. This evening you will be collected from the hotel for a welcome dinner at Fogo do Chao BBQ, a famous restaurant in Botafogo for a traditional Brazilian BBQ followed by an evening at Rio Scenarium. During the Olympics all the dignitaries used Fogo do Chao as their restaurant of choice. The Governor-General of Australia hosted an event there, as did Julie Bishop and the Australian Embassy for the Olympic team. DINNER -The story of Fogo de Chão began in the mountainous countryside of Rio Grande do Sul in Southern Brazil. It is the lessons our founding brothers learned on their family farms that gave them the ambition to share their rich culinary heritage with the rest of the world. Rio Scenarium Pavilhão da Cultura - Listed by The Guardian among the 10 best nightclubs in the world, Rio Scenarium is the temple of samba music in Rio. Located in Lapa, this 3 floors period building holds an astonishing mix of vintage stuff: an old pharmacy dating back to 30s, ancient Chinese ceramics, seasoned barber chairs and plenty of freak objects. INCLUDED: transfers, dinner at Fogo de Chao with 3hrs open bar (water, juice, soft drink, beer, caipirinha, caipivodka), entry to Rio Scenarium and reserved seating, and welcome drink at Rio Scenarium. Overnight in a Superior Room at Miramar by Windsor including breakfast (Deluxe Category Accommodation). After an early pick up from the hotel between 7:00 & 7:30am, the tour makes its way to the bottom of Corcovado Hill, where we ascend the mountain by vehicle. Climbing 4km through the Tijuca Forest, the world’s largest urban National Park, we will arrive at the statue of Christ the Redeemer. After taking in the panoramic views we continue to the famous football stadium, Maracana Stadium. We also pass the Sambadrome (where the world famous Rio Carnival is held) and the Metropolitan Cathedral, before passing through the bohemian neighbourhood of Lapa and its famous arches en-route to Copacabana. We have a traditional Brazilian BBQ lunch before visiting the famous Sugarloaf Mountain with views across the entire city. After descending the mountain, you will be dropped off at your hotel. Approximate duration of tour: 8 hours. This evening is at your leisure. We would recommend enjoying a delicious evening meal at one of the many restaurants by the waterfront of Copacabana beach as after all, Rio is famous gastronomic hub, where you can indulge in a cuisine that’s infused with Caribbean and international flavours. This morning you will be collected from the hotel. Rio de Janeiro enjoys one of the most beautiful and dramatic settings of any city in the world, and one of the best ways to see it is from the water. This delightful Guanabara Bay cruise reveals the Rio and its famous landmarks in all their glory. The relaxing cruise takes place against the stunning backdrop of the Rio cityscape, the iconic Sugar Loaf and the towering mass of Corcovado. As the cruise makes its way around the by, passengers will have the opportunity to see various landmarks such as the famous neighbourhoods of Botafogo, Flamengo, and Urca, as well as, Fort São Joao, Flagstone Island, Santa Cruz Fortress, and Rio- Niteroi Bridge. The cruise includes 4 hours of open bar (beer, caipirinhas and caipivodkas, soft drink, mineral water), a buffet of snacks (breads, olives, pates, cold cuts, sandwiches, fruit platter), as well as a full BBQ lunch. This afternoon is at your leisure. We would recommend visiting Lapa’s famous multi-coloured steps. Thousands of colourful ceramic tiles from all over the world have immortalised what is arguably the most famous staircase in the whole city. Since street art was legalised in 2015, Lapa has become a fascinating, open-air mural museum, and strolling through its iconic streets is simply delightful. Tonight we farewell this incredible journey in style. You will be collected from the hotel for an evening on the Pestana Hotel, which includes exclusive area on the rooftop terrace, cocktail service of canapés and dinner, and open bar including caipirinhas, beer, soft drinks, water. This hotel is one of the better vantage points right in the middle of Copacabana Beach, and is frequently used for high profile events. The Bar is located in Avenida Atlântica overlooking one of the world's most famous beaches, Copacabana. Overnight in a Superior Room at Miramar by Windsor including breakfast (Deluxe Category Accommodation). Departure Transfer: - Transfer from your hotel to the airport in a private vehicle. As one of the most luxurious hotels in Buenos Aires, Palacio Duhau - Park Hyatt features services and amenities for business and leisure travelers. Stay connected with complimentary Wi-Fi throughout the hotel, enjoy the variety of on-site activities, and experience local flavours and cuisine at the restaurants. The hotel rooms include pampering amenities such as butler service, plush beds, work desks, and majestic baths. Make the most of your stay at our gorgeous hotel in Buenos Aires. Deluxe Category Accommodation - Ideally situated in the heart of Iguazú National Park, Sheraton Iguazú Resort & Spa combines a beautiful landscape with friendly service, comfortable style, and great quality. Enjoy a private balcony and the exclusive Sheraton Sweet Sleeper (SM) Bed in their 176 guest rooms and four suites. The only hotel located within the Iguassu National Park, Hotel das Cataratas enjoys an unrivalled location just a short stroll from the sensational waterfalls. Guests enjoy exclusive access to this magnificent sight in the evening and at dawn, when the park is closed to other visitors. A Portuguese-colonial residence, this classic Orient-Express hotel is redolent with the atmosphere of lazy days lounging on a veranda or beneath subtropical palms. The hotel has 193 room including 15 suites, all decorated in a Portuguese style insuring that its guests live in a luxurious atmosphere. Deluxe Category Accommodation - Accommodations at Miramar by Windsor promote relaxation with sophisticated decor, Brazilian paintings, and elegantly designed guest bathrooms. Each of the 200 guestrooms features state-of-art amenities such as complimentary WiFi, minibar, electrical adapters, iPod dock, and more. Determined to complete personalized convenience, the Miramar offers an arrangement of services including an on-call butler. *Pricing is based on September 2018 rates and current USD exchange rates. These prices are subject to change until booked and deposited. As per our phone discussion we wanted to highlight where our expertise as journey designers comes into effect. However we know from experience that for a fare of $1420 - which is just $190 more we can include your domestic connection from Melbourne for example and ALL YOUR INTERNAL FLIGHTS in South America. To put this into perspective just the Buenos Aires - Iguazu Falls - Rio flights would cost $300. This also gives the advantage of having full luggage allowance on all flights included on your ticket. *Please note all airfare prices are based on a current Qantas sale and are subject to change until 2018 prices have been released on 1st 3 price points. BOOKING CONDITIONS: Please read the following terms and conditions carefully. You must not accept any booking unless you understand and agree with the following terms and conditions. Prices: All prices are subject to availability and can be withdrawn or varied without notice until booked and paid in full. Cancellation Fees: We are unable to provide a refund to you until we receive the funds from the relevant supplier. Cancelled bookings will incur charges. These charges can be up to 100% of the cost of the booking, regardless of whether travel has commenced. Fees will also apply where a booking is changed or tickets are re-issued. Where we incur any liability for a cancellation fee or charge for any booking which you cancel, you agree to indemnify us for the amount of that fee or charge. Deposit and Final Payment: We require a minimum deposit of $165 per person when booking. Your service provider will require further deposits. All deposits are non-refundable. Final payment is required no later than 6 weeks prior to departure unless otherwise stated on your invoice. Some airfares or services must be paid in full at the time of booking. Credit Card Transactions, Direct Deposits and Payment by Cheque: Credit card surcharges of 1.5% for Visa or MasterCard and 3.5% for American Express or Diners Club will apply when paying by credit card. If for any reason any travel service provider is unable to provide the services for which you have contracted, your remedy lies against that provider, and not against Journeys By Design. In the event that payment has been made to Journeys By Design by credit card, you agree that you will not seek to charge back your payment to Journeys By Design. If you are paying by direct deposit you will need to pay at least 3 business days prior to the actual due date. You must notify your consultant of your payment once it has been made. Where you pay by cheque, you agree not to stop payment of the cheque even when you cancel a booking. You agree that we may apply the proceeds of the cheque to satisfy any liability you have to us, including any liability in respect of cancellation fees, before refunding the balance to you. Taxes: Certain taxes are mandatory in various countries. There may also be an additional local tax charged at some airports. All taxes are subject to change without notice. Travel Insurance: Travel Insurance is strongly recommended. Financial product advice in this document has been prepared without taking into account your objectives, financial situation or needs. Because of that you should, before acting on it, consider the appropriateness of it having regard to your objectives, financial situation or needs. You should obtain a Product Disclosure Statement relating to the product and consider the statement before making any decision about whether to acquire the product. If you decline travel insurance you will be required to sign a disclaimer. Agency: Journeys By Design acts as a travel agent only. We sell various travel related products on behalf of numerous transport, accommodation and other wholesale service providers, such as airlines, coach, rail and cruise line operators. Journeys By Design’s obligation is to make travel bookings on your behalf and to arrange relevant contracts between you and travel service providers. We have no responsibility for these services nor do we make or give any warranty or representation regarding their standard. All bookings are made subject to the terms and conditions and limitations of liability imposed by these service providers. Your legal recourse is against the specific provider and not Journeys By Design. If for any reason, any travel service provider is unable to provide the services for which you have contracted your remedy lies against the provider and not with Journeys By Design. Liability: We do not accept any liability of whatever nature, whether in contract, tort or otherwise, for the acts, omissions or default, whether negligent or otherwise, of third party providers over whom we have no direct control. Under circumstances where liability cannot be excluded, such liability is limited to the value of the purchased travel arrangements. We do not accept any liability in contract, tort or otherwise for any injury, damage, loss (including consequential loss), delay, additional expense or inconvenience caused directly or indirectly by force majeure or any other event which is beyond our control which is not preventable by reasonable diligence on our part. Special Requirements: Please advise your consultant of any special requirements you may have, for example, special meals, medical requirements and so on. Frequent Flyer: Please advise your consultant of your frequent flyer details. These details will be passed onto the relevant supplier but cannot guarantee that the supplier will credit points for your booking. Please retain all boarding passes to allow verification of your travel if required. Passports & Visas: It is your responsibility to ensure that you have valid passports, visas and re-entry permits which meet the requirements of immigration and other government authorities. Any fines, penalties, payments or expenditures incurred as a result of such documents not meeting the requirements of those authorities will be your sole responsibility. All travellers must have a valid passport for international travel and many countries require at least 6 months validity from the date of entry. If you need information regarding visa and other travel document requirements for your trip please let us know. We can obtain such information from an external visa advisory service provider on your behalf. We do not warrant the accuracy of such information and accept no liability for any loss or damage which you may suffer in reliance on it. We can obtain visas for you if you wish and fees may apply for this service. Travel Documents: Travel documents include (without limitation) airline tickets, hotel vouchers, tour vouchers or any other document (whether in electronic form or otherwise) used to confirm an arrangement with a service provider. Travel documents may be subject to certain conditions and/or restrictions including (without limitation) being non-refundable, non-date-changeable and subject to cancellation and/or amendment fees. All travel documents are non transferable. All airline tickets must be issued in the name of the passport/photo identity holder, some carriers will deny carriage if the name varies and the booking may be cancelled. Any errors in names on your documentation will be your responsibility if not advised at the time of booking. It is your responsibility to collect all travel documents from us prior to travel. As a general rule your travel documents will be available for collection 2 weeks prior to departure, however this will depend on your individual arrangements. Please contact your consultant the day before collection to confirm that the travel documents are ready for collection. Health: It is your responsibility to ensure that you are aware of any health requirements for your travel destinations and to ensure that you carry all necessary vaccination documentation.